Wash the cauliflower and break into florets. Dry and add to food processor. Add the parsley, garlic and roughly chopped shallots to the food processor also. Pulse until the cauliflower resembles couscous. 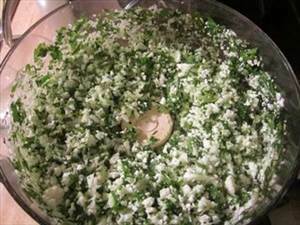 Tip the cauliflower mixture into a large bowl and add the capers and zest of the two lemons. In a separate bowl combine the oil, lemon juice and a teaspoon of tumeric. Add the oil mixture to the cauliflower and mix well. Add salt and pepper to taste. There are 85 calories in 1 serving of Raw Cauliflower 'Tabbouleh'. Calorie Breakdown: 50% fat, 38% carbs, 11% prot.